Elliot Canner (Wings) is a streetwise bounty hunter on the streets of NYC who always gets his man. When his number one most wanted target, the sadistic serial slasher Wesley Wilson (Vosloo) escapes the city and ends up in Angelique, South Africa, Canner is hot on his trail and he follows him there. Because the movie stars Wings and Vosloo, and has a similar title, you’d think this was some sort of companion piece to Living To Die (1990). But it appears to be completely unrelated otherwise. Wings is his usual charismatic, likable self, and Vosloo puts on his best scowl and evil eye as the baddie. Vosloo as Wilson doesn’t say much, but he does have a menacing presence. Plus his kill count is pretty outrageous. The plot is as basic as could be: Wings is after the serial killer. End of plot. But because Wilson is primarily hunting hookers, Wings must delve into the seedy underbelly of the city. Sure, there’s some half-assed psychological motivation to Wilson’s prostitute murders, but what’s really interesting is seeing Wings as the hero in a relatively strange foreign land, investigating amongst the seamier side of life in a quasi-slasher movie scenario. We tended to like the horror movie elements, especially since the movie also features some decent stunt work in the action scenes. Unquestionably, Wings carries the movie. Importantly, the Vidmark VHS released in the U.S. came in two versions: one cut and one uncut. Make sure you get the uncut version. Vidmark made it easy enough to do so, as there should be a square white sticker that says “the original unedited version” on the proper tape. 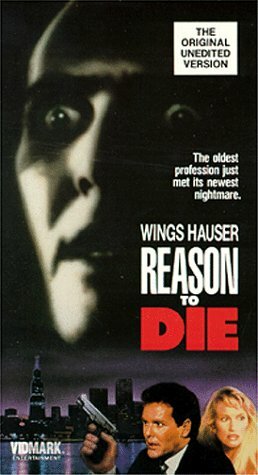 While certainly not perfect, any fan of exploitation or Wings Hauser should find some meat on the bone with Reason to Die. I am definitely a Wings Hauser fan, so I can't wait to check this out. Good stuff! Thanks! Looking forward to your review! Wings is great in this. This sounds like a good one - I have yet to find an unenjoyable Vosloo character. It is pretty good. Vosloo plays the evil villain really well!